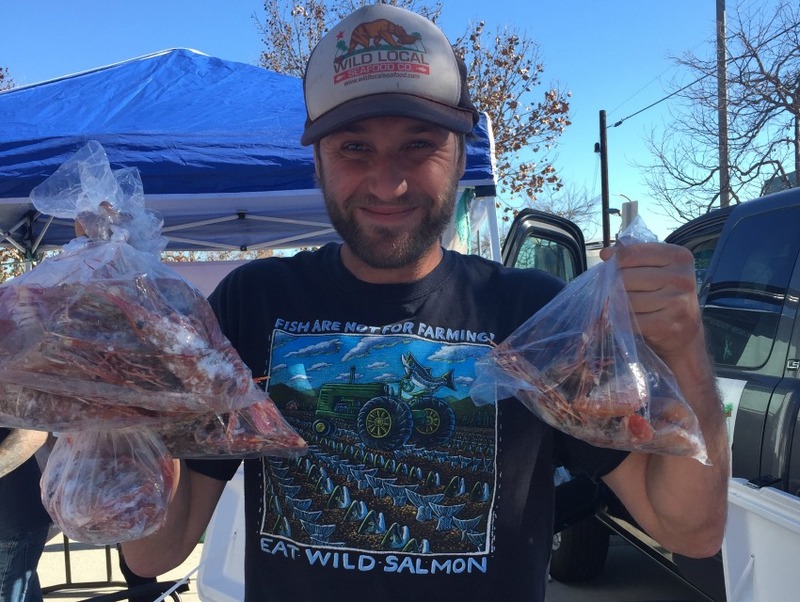 Captain Ben Hyman of Wild Local Seafood has fresh Santa Barbara spot prawns. Captain Ben Hyman spends five days a week on his boat, the Always Grinding. His weekends, however, are spent peddling fish and spreading the gospel of seasonal seafood at two Westside farmers’ markets. Last Saturday at the Pico market in Santa Monica’s Virginia Park, customers plunged elbow-deep into coolers of shaved ice for filets of fresh leopard shark, mackerel, and vermilion snapper. But chef Bruce Kalman was there for the Santa Barbara spot prawns. While spot prawns can be found from Mexico to Canada, the most prized crustaceans are fished around Santa Barbara and the Channel Islands. In Southern California, spot prawns are a harbinger of spring. In order to maintain a healthy population, quotas have been negotiated and the season has been reduced to a mere six weeks, Hyman says. At Union, Kalman is not wasting any time. Last week, he served the crustaceans with a piccata. This week, he’s pairing them with arugula and Cara Cara oranges. He prefers to salt-roast them, head-on, a process that involves burying the entire prawn in a bed of hot salt, which at once sears the exterior and seals in the juices. The early-season catch is often full of roe, which he plans to pickle. Kalman has been championing Hyman’s Wild Local Seafood catch for more than a year now. In the last year, Hyman began selling his own product and the catch of his friends and colleagues directly to customers at markets under the banner Wild Local Seafood. He claims to have 200 to 300 fisherman friends in his phone book who can call him at a moment’s notice when they have product to sell. The biggest development in his direct-selling seafood game is a forthcoming 2,000-square-foot processing plant in Ventura where single-boat fisherman can prep and bag their fish for sale at an on-site retail store and local markets. The facility, which is slated to open in this summer, is a partnership between Hyman and the city of Ventura. While it will alleviate the stress of dock prices, sustainability remains Hyman’s number one goal at the processing plant. Until the Ventura facility opens, you can find Hyman and Wild Local Seafood at the Saturday Santa Monica Pico Farmers Market and the Sunday Mar Vista Farmers Market. Next articleNot a Stretch: L.A. is Big, But it Isn’t Sprawling, OK?